For 35 years Precision Glassblowing has been a manufacturer of laboratory and custom glassware in support of the scientific community worldwide. 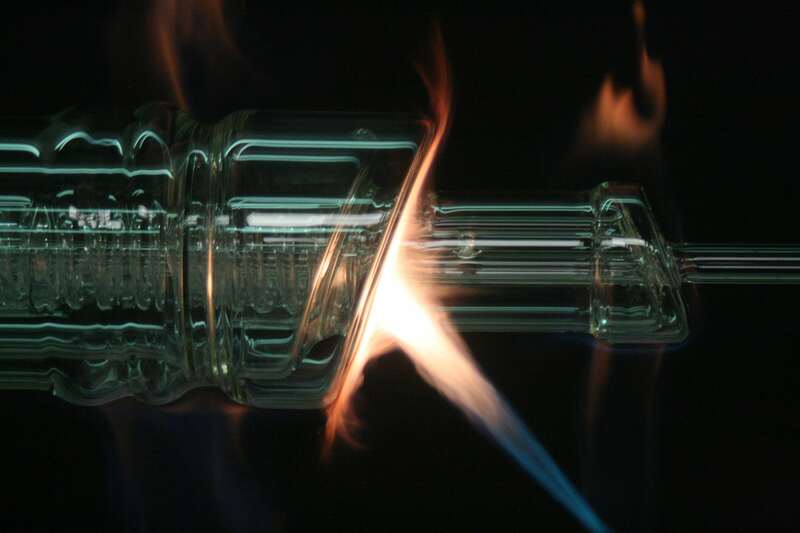 With the basic concept of what your glassware needs to do, Precision can help design and engineer custom items made from borosilicate or quartz glass. While there are many sources for basic laboratory glassware such as beakers, funnels, and flasks, Precision excels at the non-standard glassware items and we possess the capability to cost-effectively produce prototype to production quantities. With lathes spanning the range of micro to large diameter and a complete in-house machine shop, we have most of the required tools for every job. If not, we can make them. The items we produce are made from glass tubing, glass plate, ASTM certified joints, and other specialty fittings produced by some of the top scientific glass manufacturers. A listing of standard tubing sizes and joint sizes is a great place to start when designing your own custom glassware and below are links to such information. We can accept most CAD files once you have produced your design but also work from hand-drawn sketches if the complexity does not justify the time involved to produce an official drawing. Unlike metals and plastics, glass behaves differently so various design features may require slight modification to ensure they can be manufactured and are not prone to breakage after receipt.